I’ve lost my mojo a bit lately. I dunno if it’s that there’s been a hiccup with my holiday plans, or that I’ve hit a plateau weight loss wise and don’t quite know how to bust it…. But I feel a bit hmph.. bleh… real articulate I know, but i’m sure you get the picture. Any tips for breaking through the plateau? And, I really cannot imagine eating less calories…. Anywho’s, the other day I was saying how I have been using Mountain Bread and got their cookbook. Well, I made yummy sausage rolls with it. It was a great dinner. I used some organic free range pork, just for a change, but you could use beef, turkey, kangaroo mince, whatever your preference is. I had yummy fresh italian herb mix in my mince, and then placed some in the centre of a rye mountain bread wrap, and rolled it. It said to use a little water to seal, but I found I had to use a LOT of water, like literally run the roll under running water and drench it! Then, I baked at 180 degrees, for 30 mins – but you have to keep a careful watch that it doesn’t burn. 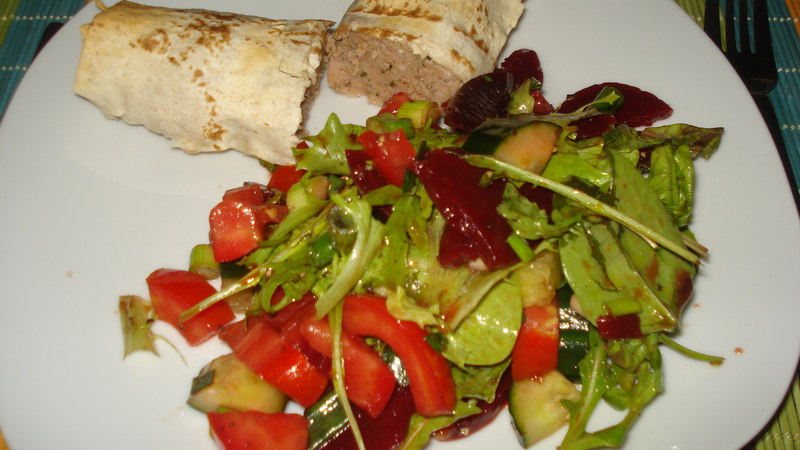 I served with salad, with a tablespoon of flax oil and balsamic for dressing. So yummy, and soooooo great to have a change from the usual. I hightly recommend trying it, the boyfriend loved them too, and normally doesn’t go near normal pastry sausage rolls as they give him heartbrn, but these were great!